The last two months have been highly productive in the Dapp space. In fact, according to the graph below, the last two months have had the most number of new Dapps enter the space. According to this article, a record-breaking 66k users were active on both EOS and Ethereum based Dapps combine on October 9th. So, keeping that in mind, how has November been building up so far? Ethereum has far and away the highest number of Dapps and contracts. 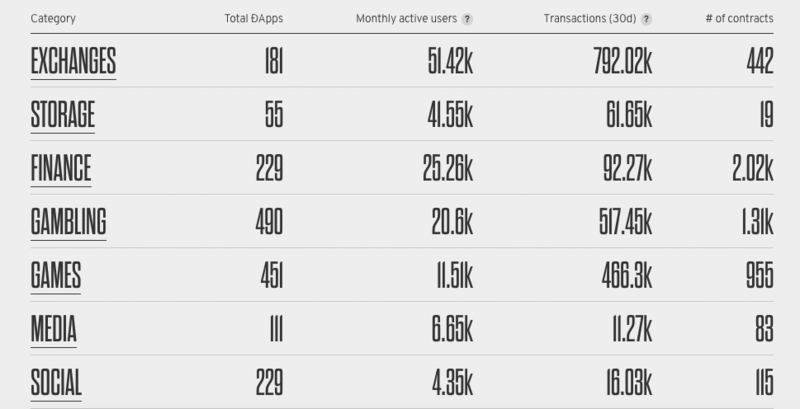 However, EOS seems to have the highest number of daily active users, daily transactions, and daily volume. As usual, exchanges seem to be the ones enjoying the highest amount of monthly active users and monthly transactions. However, when it comes to the total Dapps in that ecosystem, it seems like the Gambling category is on top with 490 total Dapps in the system. The Gaming category is a close second with 451 total Dapps. The Finance category seems to have the most number of smart contracts. Now let’s look deep into the performance both Ethereum and EOS Dapps. First and foremost, let’s look at the general daily statistics of Ethereum Dapps. The graphs have been calculated from November 1st onwards. The number of daily users in Ethereum Dapps since the beginning of the month has been pretty consistent. According to the graph, the average number of users has been between 9000-10000 with a peak of 11,137 users on 1st November 2018. When it comes to daily volume, there are two noticeable peaks and two noticeable valleys. The Peaks: On 8th November Ethereum Dapps experienced peak volume of 18,194.13 ETH. On 20th November, Dapps experienced a volume of 17,020.19 ETH. The Valleys: The first major valley was experienced on 11th November with 7,646.4 ETH. However, the volume hit a monthly low (as of writing) on 17th November with 6,656.79 ETH. Ok, so let’s start with the most widely used Dapp category in Ethereum. Peak: 1st November with 4043 users. 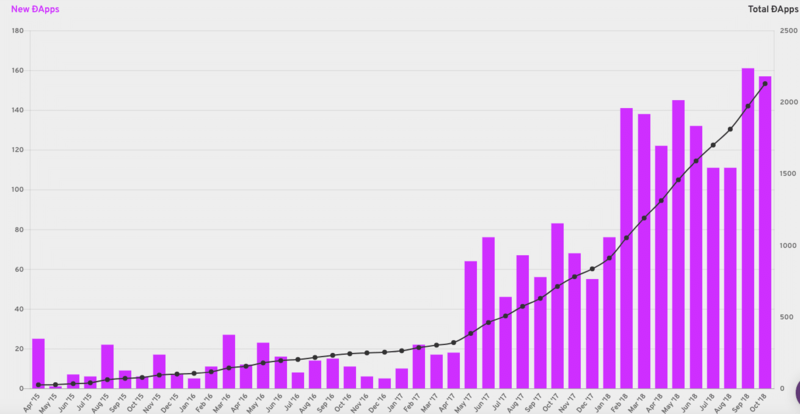 It looks like the number of users has been pretty consistent apart from the beginning and the end. The interesting thing to note here is how both the daily users and daily volume graph of exchanges resembles the daily users and daily volume graph of all Dapps on Ethereum. That’s a true testament of how popular a category Exchanges are. Peak: 8th November with 14,462.34 ETH. IDEX is easily the most popular exchange on Ethereum. So, what we have here is the daily users and daily volume stats taken from the beginning of November. Daily Users(green): IDEX had maximum users on 1st November and the least on 22nd November. November 1 saw 1638 users while 22 November saw 706 users. Along with that, the daily user graph had another noticeable valley around 17th and 18th November. Daily Volume(red): The daily volume graph has a very noticeable peak on 8th November 10,662.63 ETH. The funny thing is that IDEX announced beforehand that they are going to review their Q3 results on 8th November. We are not saying that they are related to each other. This could be a mere coincidence. 1870.99 ETH was the least volume that IDEX had and that was on 17th November. As we have mentioned above, 17th November was when IDEX had one of their lower number of daily users. IDEX has had 21 events in the last 30 days which is an overall 59.62% decrease in dev activity. ForkDelta is a decentralized Ethereum Token Exchange. Let’s check out the Daily Users and Daily Volume statistics for ForkDelta from November 1 onwards. Daily Users(green): ForkDelta has attracted a pretty consistent number of daily users before a sudden dip after 21st November. They experienced a peak on 8th November with 1013 users. They recorded the least number of users on 18th November 728 users. Looking at the developer activity, it looks they have had 503 events in the last 30 days which is significantly more than IDEX’s activity. Having said that, they have still had a 32.57% decrease in activity. Bancor is one of the most well-known Ethereum Dapps out there. Let’s look at the statistics. Whoa….that’s a pretty interesting graph, to say the least. Daily Users(green): It looks like they have had some consistent number of daily users apart from the two noticeable valleys on 17th and 22nd November. In the time period given, they hit peak users on 20th November with 194. Daily Volume(red): This where things become a little messy. According to the graph above, Bancor has had 0 volume except on 20th November when they peaked to 8 ETH. The peak daily volume matched with the peak daily users. However, we checked another graph (from State of The Dapps). This one says that they have had ~20,992 ETH of total volume in the last 7 days and 76,627.335 ETH total volume in the last 30 days. So we have some conflicting information here. Looking at the developer activity, it looks they have had 45 events in the last 30 days which is a 68.97% decrease in activity. The interesting thing to note is that the number of users is pretty consistent before that big drop around 21st November. Peak: 13th November with 2856 users. The daily volume graph has two pretty drops around 3rd November and 21st November. Peak: 16th November with 365.13 ETH. Note: Graphs taken from November 1st. 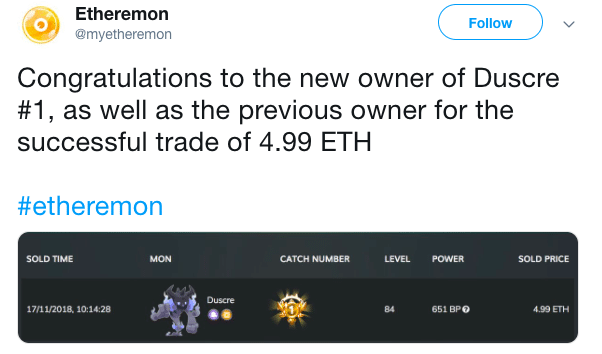 As the name pretty much suggests, Etheremon is a Pokemon-like game developed on Ethereum. Daily Volume(red): The daily volume has 3 noticeable peaks on 1st November, 11th November, and 17th November. They enjoyed max volume on 17th November with 6.68 ETH. They had the lowest volume on 16th November, literally the day before, with 0.5 ETH. That transaction happened on….you guessed it. 17th November. They have had 6 events in the last 30 days with a 50% increase from the previous month. The Dapp that broke Ethereum! Let’s check its stats. Daily Users(green): Cryptokitties has a pretty steady number of users and they didn’t dip that dramatically towards the end like all the other Dapps. What it goes to show is that while large number of new users may not be joining the game, they still have a solid base of loyal users. Peak was on 13th November with 450 users. They had a minimum of 316 users on 20th November. Daily Volume(red): The daily volume has 3 noticeable peaks on 1st November, 16th November, and 22nd November. They enjoyed max volume on 22nd November with 170.48 ETH and lowest on 10th November of 61.89 ETH. They haven’t had any recent developer activity. Daily Users(green): Blockchain Cuties has a pretty good amount of daily users since November 1st apart from the one really noticeable dip on 14th November with 131 users. They enjoyed the peak of 380 users on 8th November. On 8th November they held a special podcast inviting their users. That could be the reason behind the peak. Daily Volume(red): The daily volume has one huge peak on 2nd November with 8.15 ETH. They hit a low on 6th November with 0.41 ETH. This could be an explanation behind the increase in transactions. The most noticeable thing in this graph is the significant peak around 17th November which precedes the significant drop. Peak: 17th November with 2328 users. Talk about a graph with twists and turns! There are pretty regular peaks and valleys, especially after 15th November. Peak: 6th November with 4635.36 ETH. We decided to turn things around when it came to gambling Dapps. Instead of going with daily users, we decided to rate them according to weekly transactions. Let us know if you are put off by the inconsistency and we will adjust this in future reports. 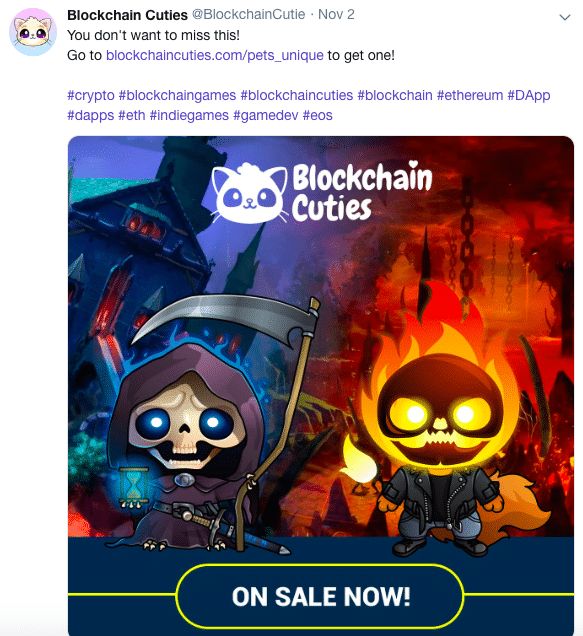 As the name suggests, it is a dice game based on Ethereum. Daily Users(green): The number of daily users increased steadily till 9th November before gradually decreasing. On 9th November they had 125 users while they hit a low of 68 users on 22nd November. Daily Volume(red): The daily volume hit one extremely noticeable peaks on 6th November with 3860.63 ETH. On 22nd November the daily volume low of 1050.42 ETH coincided with the daily user low. On 5th November, dice2win briefly overtook IDEX and became the leading Dapp with the highest 24-hour volume. That must have definitely helped dice2win to achieve its 6th November peak. dice2win has had 12 events in the last 30 days a 20% decrease in the overall development activity from the last month. Etheroll is a provably fair Ether dice gambling on the Ethereum blockchain with a 1% house edge. Daily Users(green): While the graph definitely has a lot of twists and turns, there aren’t any noticeable peaks and valleys. Etheroll hit a peak of 50 users on 15th November and a low of 28 users on 19th November. Daily Volume(red): The daily volume hit one extremely noticeable peaks on 18th November with 1916.45 ETH. On 11th November the daily volume low of 148.6 ETH coincided with the daily user low. Etheroll doesn’t have any recent developer activity. FCK is a decentralized game platform based on blockchain technology. Daily Users(green): There is a noticeable peak in the number of daily users on 17th November with 1376 users. However, apart from that, it doesn’t look like they have a lot of daily users. They hit a low of only 5 users on 3rd November. Daily Volume(red): The daily volume hit the same peak as the daily users’ graph on 17th November with 582.78 ETH. The graph has a lot of movement but it hit its lowest on 9th November with 50.02 ETH, which coincides with a valley on the daily users graph as well. FCK doesn’t have any recent developer activity. In this section, we are going look into the best EOS Dapps same categories as before. Daily Users(green): Newdex seems to be enjoying a pretty high level of user activity. However, they pretty clearly enjoyed a high level of user activity 14th November with 1800 users. They saw a low of 1113 users on 10th November. However, this also means that they have gotten more than 1110 users throughout our time period, which is really good (when compared to other Dapps). Newdex doesn’t have any recent developer activity. Daily Users(green): DEXEOS has had plenty of peaks and valleys in the given time period. They experienced a high of 403 users on 12th November. However, 4 days later, on 16th November they had a low of 127 users. Daily Volume(red): The daily volume hit a high of 61,291.6 EOS on 1st November and a low of 9840.07 on 15th November. Funny thing is that the daily volume low hit the same time as a peak on the daily users graph. DEXEOS doesn’t have any recent developer activity. Daily Users(green): WhaleEx had somewhat increased their daily users till 9th November when their hit a high of 973 users on 9th November. Less than a week later, on 15th November they experienced their low of 138 users. Daily Volume(red): The daily volume graph has 3 significant peaks on 9th, 12th, and 18th November. They experienced their high of 167,370.27 EOS on 12th November. On 2nd November they had their low of only 146.06 EOS. WhaleEx doesn’t have any recent developer activity. So there you have it. 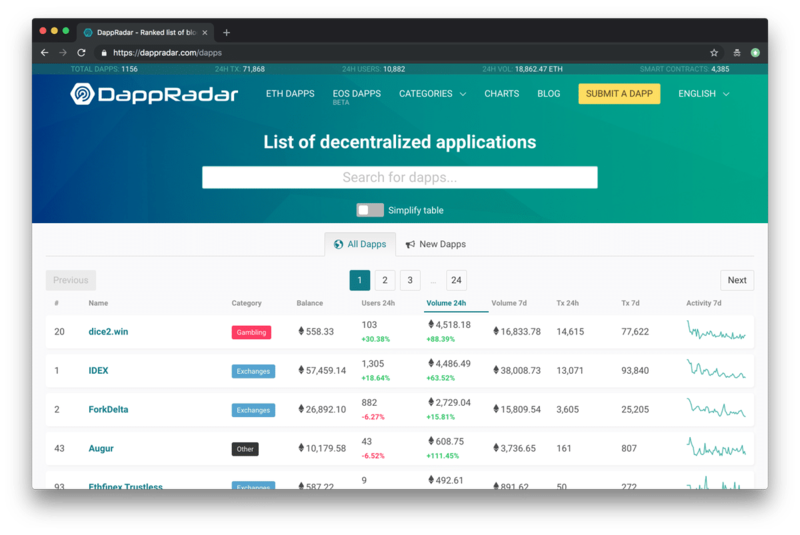 The state of Dapps report of November 2018. Let us know what you think about it. If we get positive feedback on this, then we are going to release this every month. Let us know what all we can do to improve on this current report!